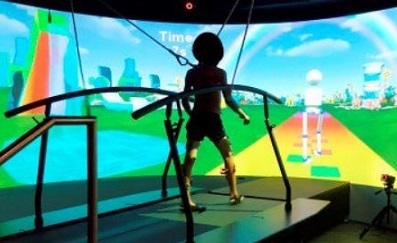 A recent study has concluded that biofeedback and virtual reality show promise as a tool for gait therapy in children with Cerebral Palsy. This was conducted using the Motek GRAIL (Gait Realtime Analysis Interactive Lab) in the Netherlands, read more. The study, entitled “Immediate Effects of Immersive Biofeedback on Gait in Children With Cerebral Palsy“, looked at whether technology can improve paediatric Cerebral Palsy rehabilitation and was set in a rehabilitation clinic. The objective was to investigate the immediate response to avatar-based biofeedback on 3 clinically important gait parameters: step length, knee extension, and ankle power in children with Cerebral Palsy (CP). The participants were children with spastic paresis who were able to walk without assistive devices. The children walked on a treadmill with a virtual reality environment. Following baseline gait analysis, they were challenged to improve aspects of gait. Children visualised themselves as an avatar, representing movement in real time. They underwent a series of 2-minute trials receiving avatar-based biofeedback on step length, knee extension, and ankle power. To investigate optimisation of biofeedback visualisation, additional trials in which knee extension was visualised as a simple bar with no avatar; and avatar alone with no specific biofeedback were carried out. Gait pattern, as measured by joint angles, powers, and spatio-temporal parameters, were compared between baseline and biofeedback trials. Participants were able to adapt gait pattern with biofeedback, in an immediate response, reaching large increases in ankle power generation at push-off (37.7%) and clinically important improvements in knee extension (7.4o) and step length (12.7%). Biofeedback on one parameter had indirect influence on other aspects of gait. Children with CP show capacity in motor function to achieve improvements in clinically important aspects of gait. Visualising biofeedback with an avatar was subjectively preferential compared to a simplified bar presentation of knee angle. Future studies are required to investigate if observed transient effects of biofeedback can be retained with prolonged training to test whether biofeedback-based gait training may be implemented as a therapy tool. Department of Clinical Applications and Research, Motek Medical BV, Amsterdam, the Netherlands. Department of Biomechanical Engineering, Delft University of Technology, Delft, the Netherlands. Read the full study on the science direct website.